Picture a woman standing waist deep in a dark rippling ocean, there is movement all around her. Waves break against her body and feminine curves creating a soft slick texture, and a beautiful natural scene. This image is what inspired the design for day 23. The design is about water, more specifically waves and what they look like wrapped around a women’s figure. Day 22 was one of the first days we finished on time leaving the design team a long evening and a good night's sleep. The rest provided the design team clarity. They felt refuelled and inspired waking up today, this rest allowed for passion and emotion in the design today. Day 23’s blouse is made up of soft lines and white fabric to represent the purity of water. We played with destroying parts of the white fabrics texture, to mimic the breaking of waves. When a wave breaks, it collapses in on itself generating a frothy white hem, that runs down the length of the wave, creating a break in the waters colour and texture. 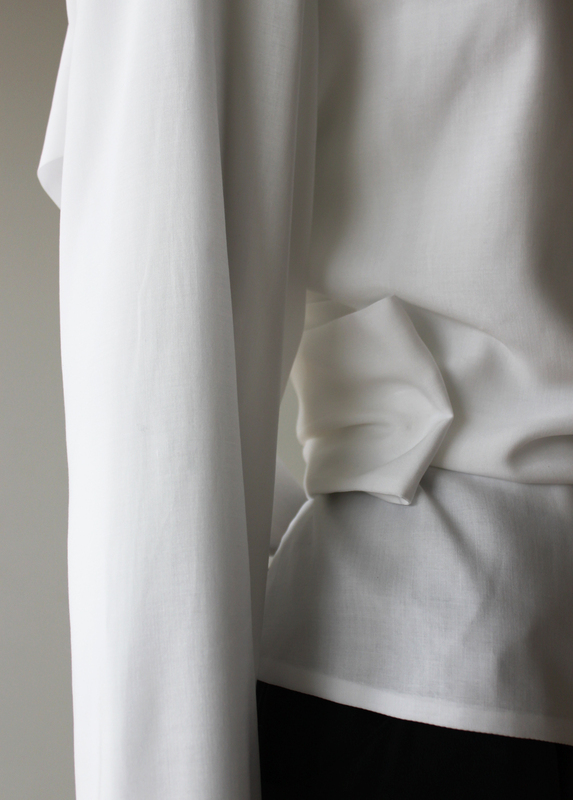 Today we created a blouse, with a pure-white simplistic front, followed by powerful details and movement in the back. The back of this design represents the power behind water and the physical appearance of rolling waves. The detailing is based on the imagery of a woman standing with her back facing the ocean, and waves breaking against her. Creating a texture on the flip-side, but smooth flowing lines wrapping around her front. Day 23’s blouse is a balance of soft gentle movement, mixed with the potential to be powerful and unpredictable. We were all encapsulated by this image today and it inspired everyone. Today was a great day for the team to picture both the inspiration and the design, meaning that the design process was engaging and fulfilling.